A Companion to the Latin Language presents a collection of original essays from international scholars that track the development and use of the Latin language from its origins to its modern day usage. 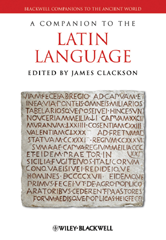 Brings together contributions from internationally renowned classicists, linguists and Latin language specialists. Offers, in a single volume, a detailed account of different literary registers of the Latin language. Explores the social and political contexts of Latin. Includes new accounts of the Latin language in light of modern linguistic theory. Supplemented with illustrations covering the development of the Latin alphabet.